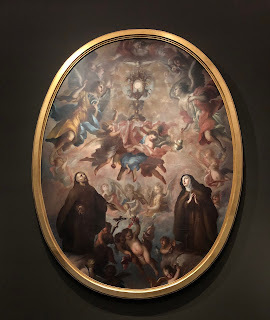 “Painted in Mexico 1700-1790” is the name of an exhibition I saw a week before it closed at the Los Angeles County Museum of Art (LACMA). It was a six-year undertaking by the co-curators ILona Katzew, curator and department head at LACMA, Jaime Cuadriello and Paula Mues Ortis of Mexico City and Luisa Elena Alcalá of Madrid. The curators toured Mexico in search of paintings never before recorded that told a piece of art history about which little was known. 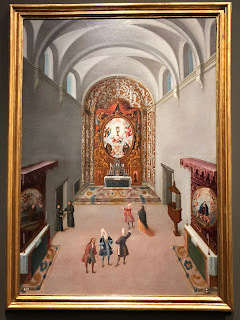 By the 16th century artists from Spain were already coming to the New World either to decorate the new churches or complete artistic commissions. Some formed workshops, which lasted generations. 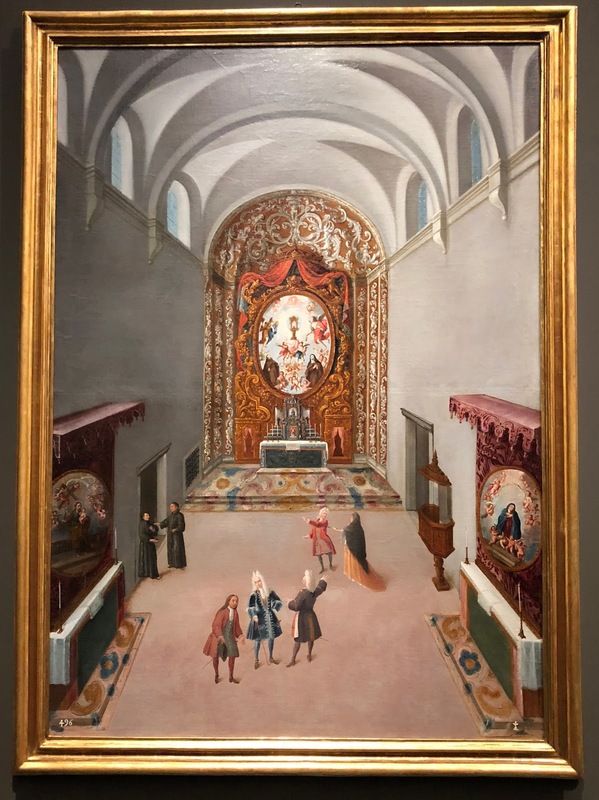 By the 17th century there were artists born in New Spain who had no experience in the Old Country but were informed by a combination of paintings and prints by their forbearers and the world they knew. This exhibition shows that by the 18th century the Mexican artists developed their own styles. The exhibition begins with a large painting, “Apotheosis of the Eucharist”, 1723 by Juan Rodriguez Juárez 1675-1728 commissioned for the newly established convent of Corpus Christi in Mexico City. Nearby are two paintings attributed to Nicolás Enriquez (1704-c.1790). One is the Interior of the Church of Corpus Christi with a view of the main altar where you can see the Juan Rodriguez Juárez altarpiece which is my previous illustration. 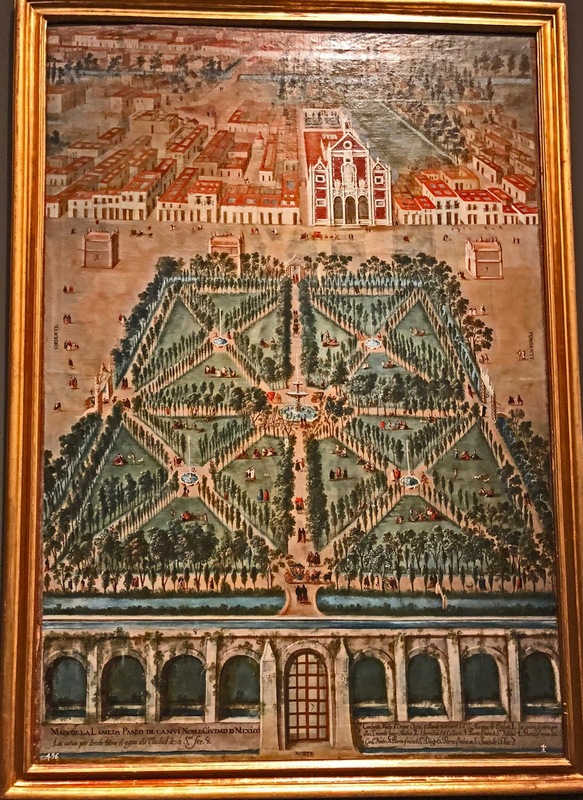 The second image is of the Alameda Park and Convent in Mexico City where we were a few months ago and I wrote about. These two paintings were lent to the exhibition from the Royal Palace in Madrid as they were commissioned and sent to the King of Spain to show the progress already made in New Spain and to garner continued support for these ventures. Like many other exhibitions this one is divided into themes, such as Great Masters, Master Story Tellers, Noble Pursuits and a number of others. Due to a rather disjointed installation it was difficult to follow these themes but it did not detract from the enjoyment of the exhibition and the feeling of discovery. As I recently wrote about the Virgin of Guadalupe I will illustrate “Allegory of the Patronage of the Virgin of Guadalupe over New Spain,” by an unknown artist, dated 1786, one of a number of depictions in the exhibition. It was lent by a private collector in Mexico City and is a devotional picture set in an especially lavish silver frame. 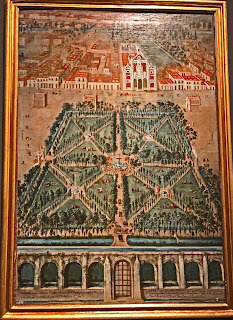 The influence Europe still had on the New World is evident in a large painted folding screen, known as a biombo, with Fête Galante and Musicians, attributed to Miguel Cabrera (1715-1768), ca. 1760. Except for the Spanish costumes it looks like it could have been imported directly from France and and the composition has been traced to a French print. 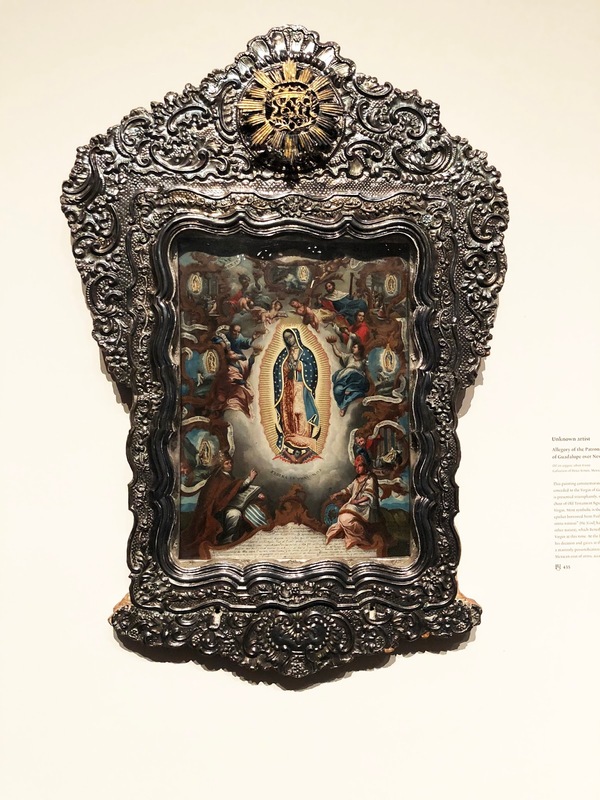 This piece from a private collection has been on loan to Fomento Cultural Banamex, A.C., the non-profit branch of the National Bank of Mexico (Banamex) located in Mexico City. It co-organized the exhibition with LACMA and was its first venue. Though very difficult to decide, I will end with what is, at the moment, my favorite picture in the show. It is by Nicolás Correa (1657 - ca.1708), “Procession of Saint Rosalia of Palermo”, 1708, from another private collector in Mexico City. The scene evokes the miracle during the plague that struck Palermo in 1625. I love paintings where every time you look at them, with fresh eyes, you make a new discovery; here the individual figures in the crowd. You will have another opportunity to see the exhibition, which is heading now to the Metropolitan Museum in New York where it will open on April 24 and remain until July 22. If I end up seeing it again I may write with a new view!